This is our first year planting a garden and we've done so in a raised bed garden. 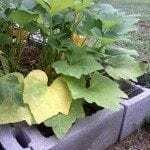 Our Crookneck squash are turning dark yellow/orange and getting knotty WAY before they reach a mature size. What are we doing wrong?